Security Master AV is a new fake security program from the same family of rogues as My Security Engine, Security Guard, CleanUp Antivirus, etc. It looks like a real security application, but unlike it, can not remove viruses and trojans, as well as protect your computer from possible infections. This parasite is created with one purpose, to force you to buy its full version. Security Master AV infiltrate computers through the use of trojans. When the trojan is started, it will download and install the rogue onto your computer. When Security Master AV is installed, it will register itself in the Windows registry to run automatically. Further, the program will begin a system scan and list a lot of trojans, viruses and other malicious programs. Of course, the scan and its results are a fake. The rogue uses the false scan results as method to trick you into purchase the full version of this program. So you can freely ignore all that Security Master AV will show you. While Security Master AV is running, it will display various misleading notifications and fake security alerts from Windows taskbar. However, all of these alerts and notifications is a fake and like false scan result should be ignored. 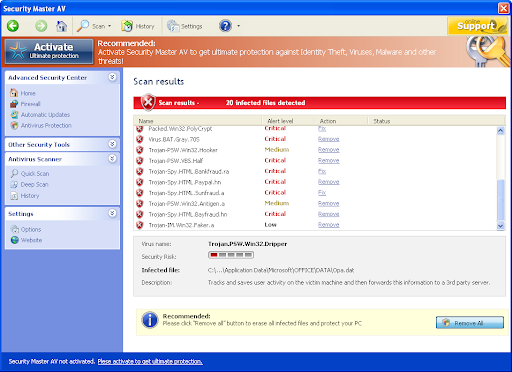 What is more, Security Master AV can block Windows task manager and the work of antivirus software, redirect you to the malicious web sites, and much more. As you can see, Security Master AV is absolutely useless and what is more, even dangerous software. Most importantly, do not purchase it! Instead, please use the Security Master AV removal guide or the instructions below to remove this malware from your computer for free. Click the red Moveit! button. If you are asked to reboot the machine choose Yes.